DPCI helps New York Cares, the largest volunteer organization in New York City, implement Drupal as the new Web content management system for newyorkcares.org. Founded in 1987, New York Cares is New York City's largest volunteer organization, running volunteer programs for 1,300 nonprofits, city agencies, and public schools to help meet the critical needs of people living in poverty. New York Cares staff works with partner organizations to identify their most pressing needs, creates projects to bridge the gaps, and recruits, trains, and deploys teams of volunteers to make a difference for disadvantaged New Yorkers. More than 56,000 people volunteer with New York Cares year after year because they know they make a real difference. 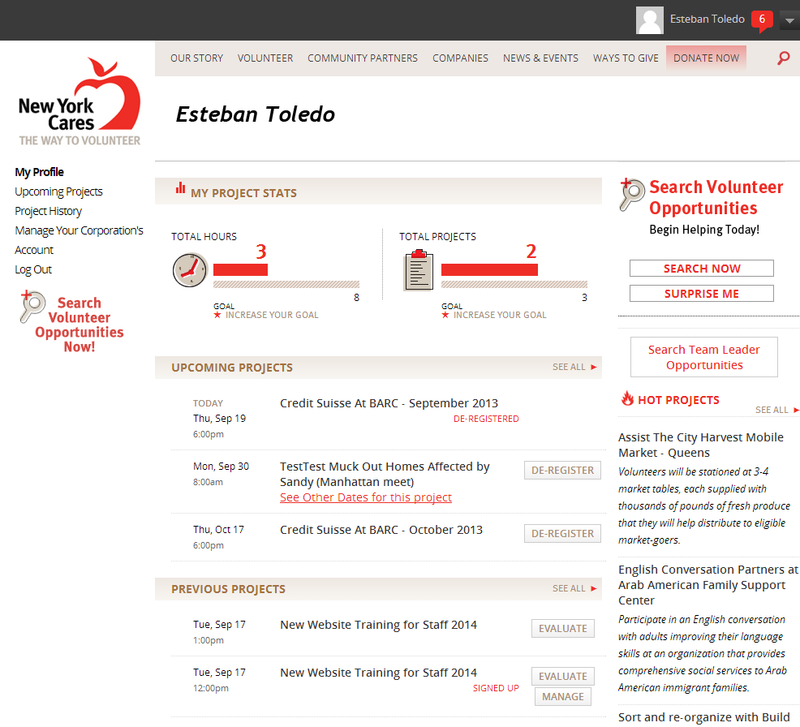 New York Cares maintains all volunteer and campaign details in its Salesforce CRM which is integrated with the Website. 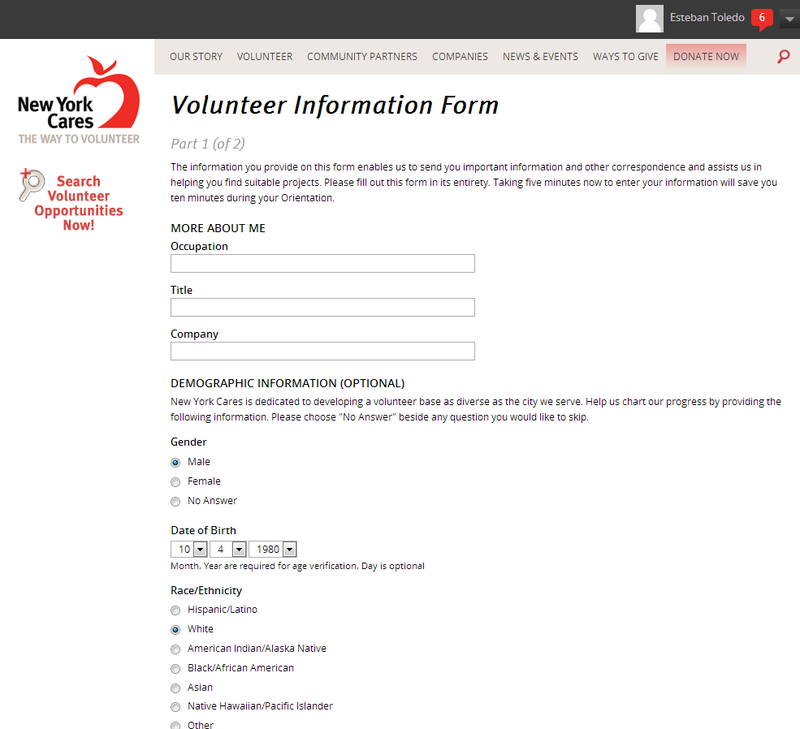 Almost all interactions between volunteers and New York Cares take place through the Website, where volunteers can search and sign up for projects they are interested in. 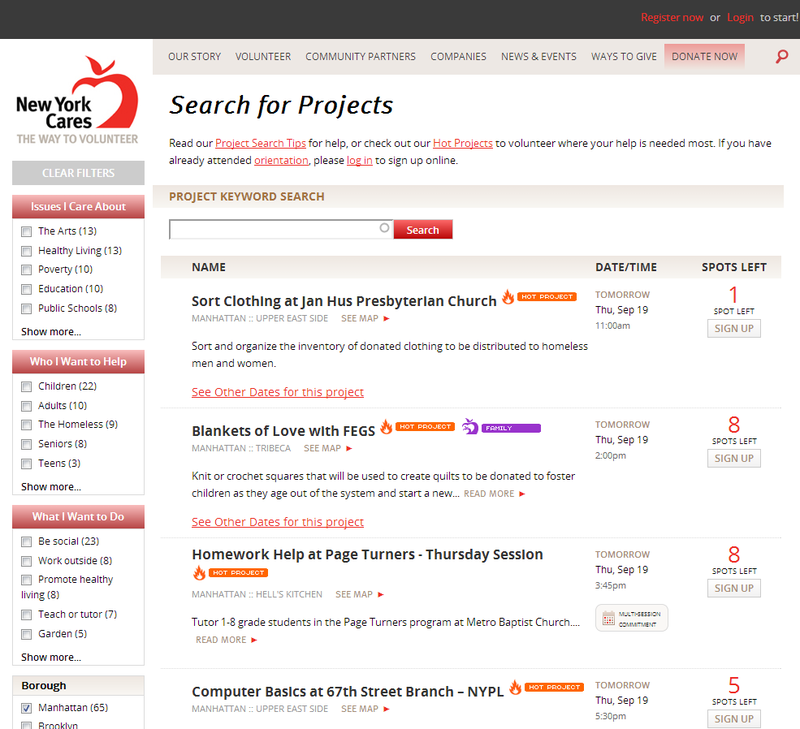 Volunteers felt that the project search was difficult to use and the results were not optimal. Once signed up for a project, most communication between Team Leaders and Volunteers was a separate, manual process handled through email or other means. In addition, New York Cares staff found the HTML frontend Website pages difficult to edit and standardize and often times required intervention by resources proficient in HTML. 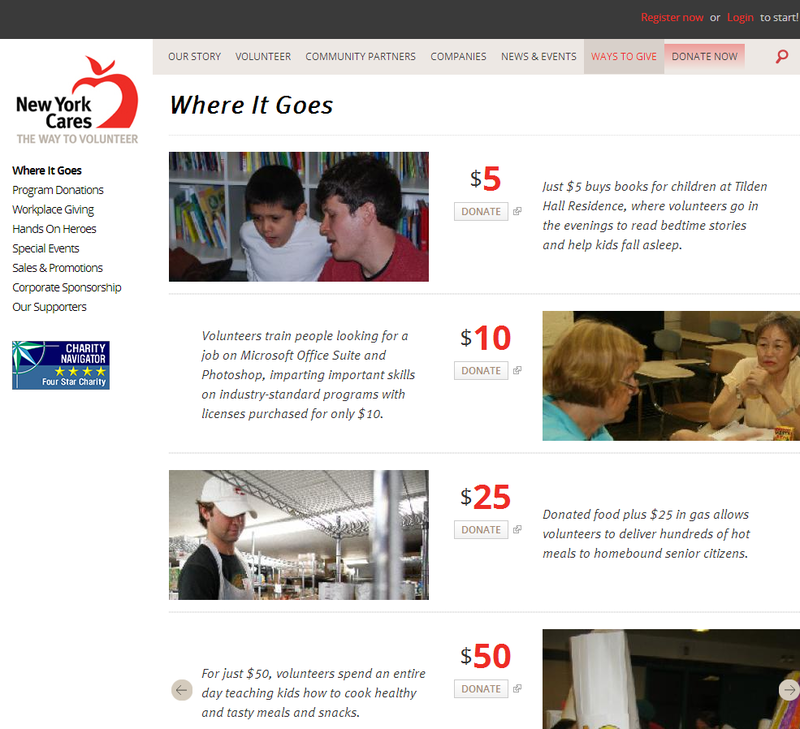 New York Cares was looking to rebuild www.newyorkcares.org to provide a more engaging and dynamic resource for the online community of volunteers and better represent the many programs and projects the organization runs in New York City. Through a redesign, the organization hoped to modernize the look-and-feel of the Website, improve navigation, expand project search functionality, offer helpful resources for users, and add interactivity to a largely static site. 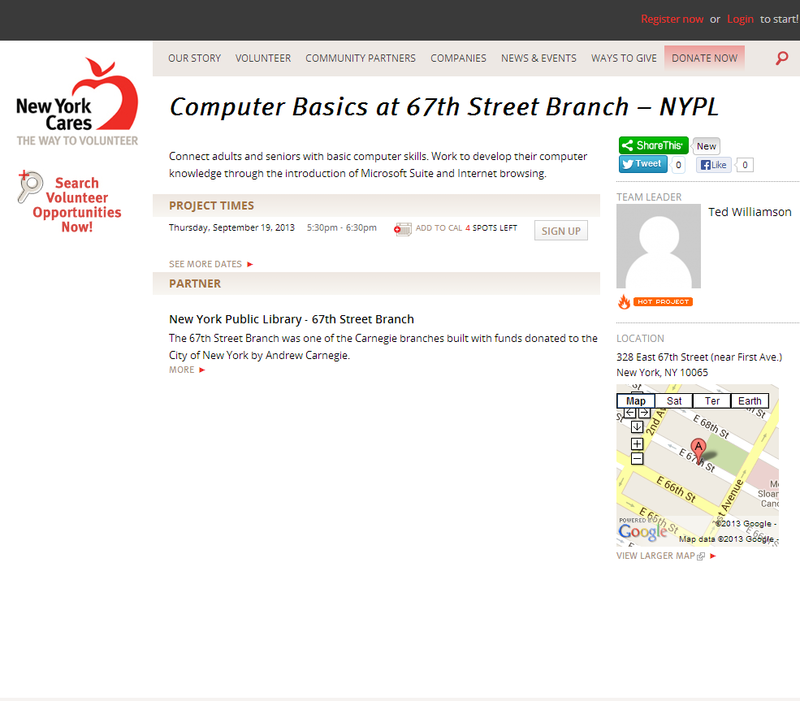 New York Cares management considered adopting an open source Web content management system that would allow their staff to fully manage www.newyorkcares.org. DPCI recommended Drupal 7 as the underlying Web content management system to meet the non-profit organization’s needs. 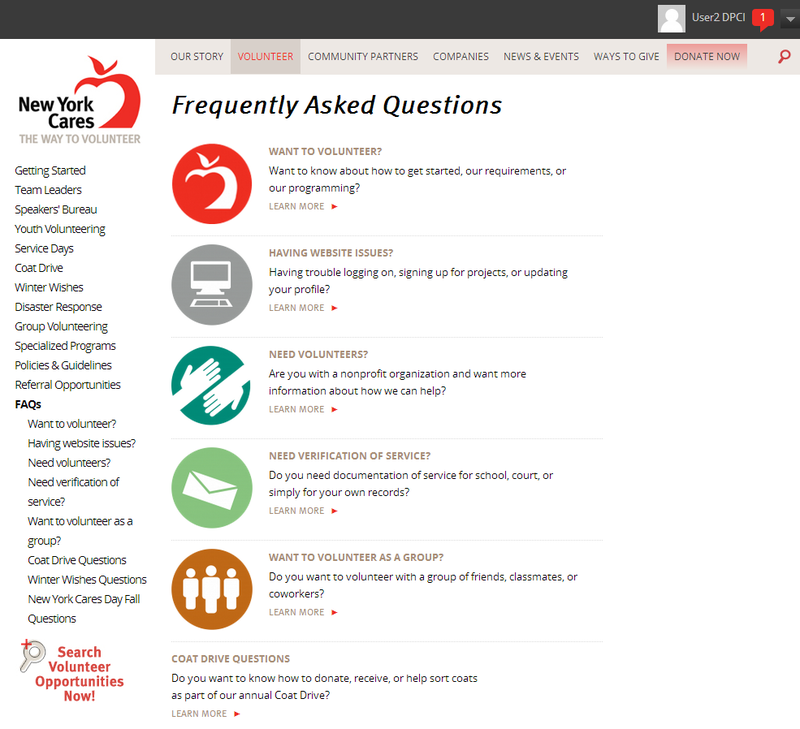 DPCI provided Drupal consulting services to develop an attractive and intuitive Website to demonstrate why New York Cares is the leading volunteer organization in New York City and for volunteers to easily find and signup for the broad range of projects offered by the organization. DPCI began by reviewing and clarifying the wireframes, requirements and visual designs provided by New York Cares staff for the new Website. DPCI then collaborated with New York Cares IT staff on the best Website architecture and strategy for integration with Salesforce to support user authentication, volunteer registration and access to hundreds of thousands of projects. Once the solution requirements were validated by DPCI and approved by New York Cares staff, DPCI translated the requirements into technical specifications for the implementation of a Web platform that would dramatically improve the content management workflow for New York Cares staff and enhance the online experience for both current and future volunteers. DPCI utilized a suite of Drupal contrib modules for Salesforce integration. The Salesforce Suite allows for field mapping functionality between Salesforce objects and Drupal entities. The provided API architecture allowed DPCI to customize additional modules and forms unique to New York Cares for user authentication, online registration and project details. On a scheduled basis, Drupal imports project details and contact records from Salesforce, then, New York Cares’ content editors can further enhance the Drupal nodes with photos and other related resources. To improve search performance, DPCI integrated Drupal with Apache Solr search platform using the Apache Solr Search module. DPCI developed a specialized project search that provides multiple categories such as interests, location and timeframe, for current and future volunteers to filter search results in real-time. 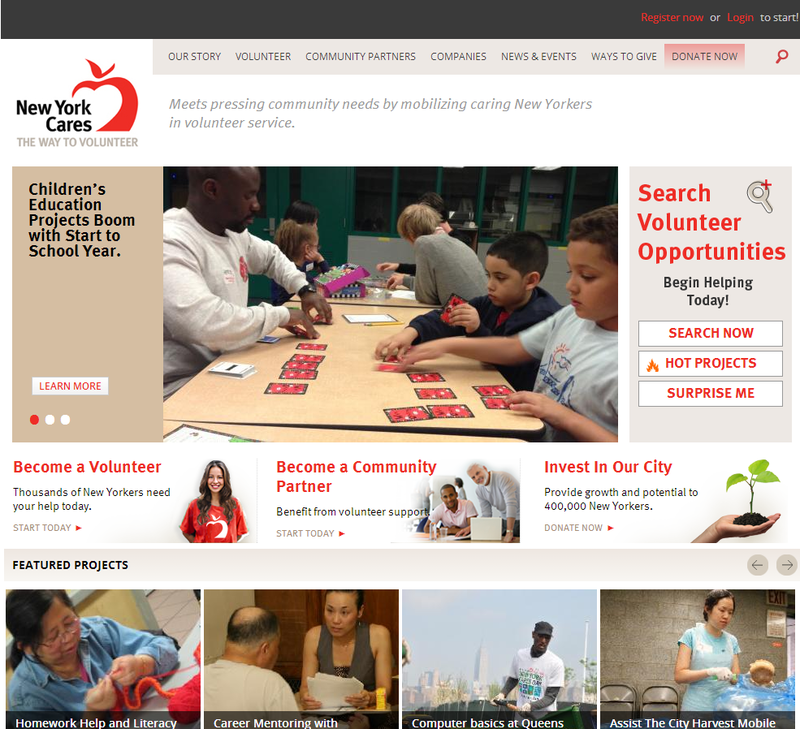 To help New York Cares recruit volunteers for specific projects, DPCI used views and blocks throughout the Website to showcase projects designated as ‘Featured’ and ‘Hot’. In addition, each section features its own rotating carousel, where New York Cares content editors can use the Nodequeue module to engage site visitors with eye-catching content previews. Once logged into the Drupal Website, project Team Leaders have special management features for their projects, such as the option to list all registered volunteers, add or deregister volunteers, view attendance for completed projects and send messages to individual or groups of volunteers, all without leaving the project details page. Once a volunteer has completed the signup process, their individual profile pages list statistics such as number of projects and hours volunteered, quick links to both future and past projects, as well as access to view and reply to messages sent by a project’s Team Leader. 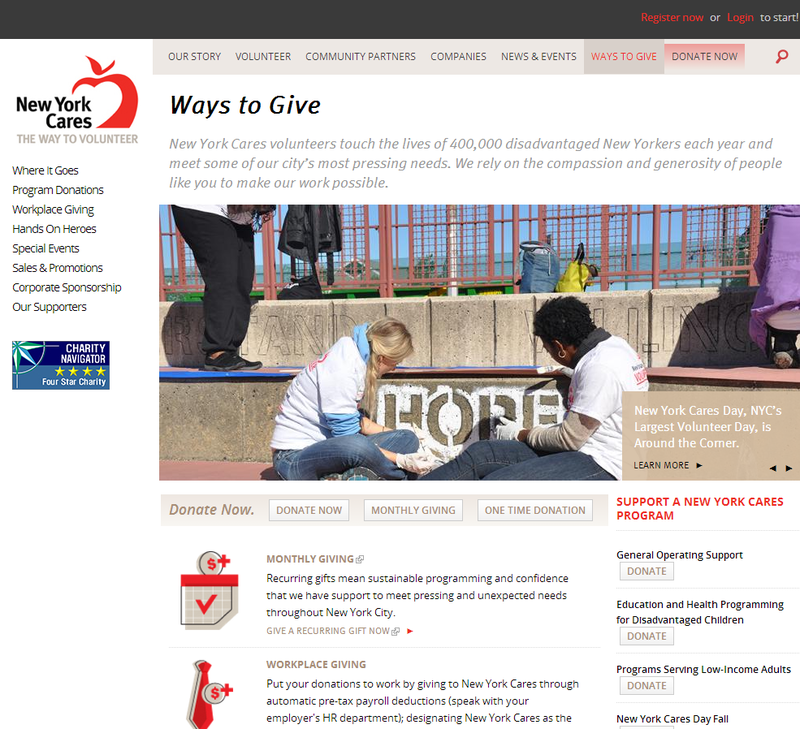 New York Cares launched www.newyorkcares.org, powered by Drupal in September of 2013. 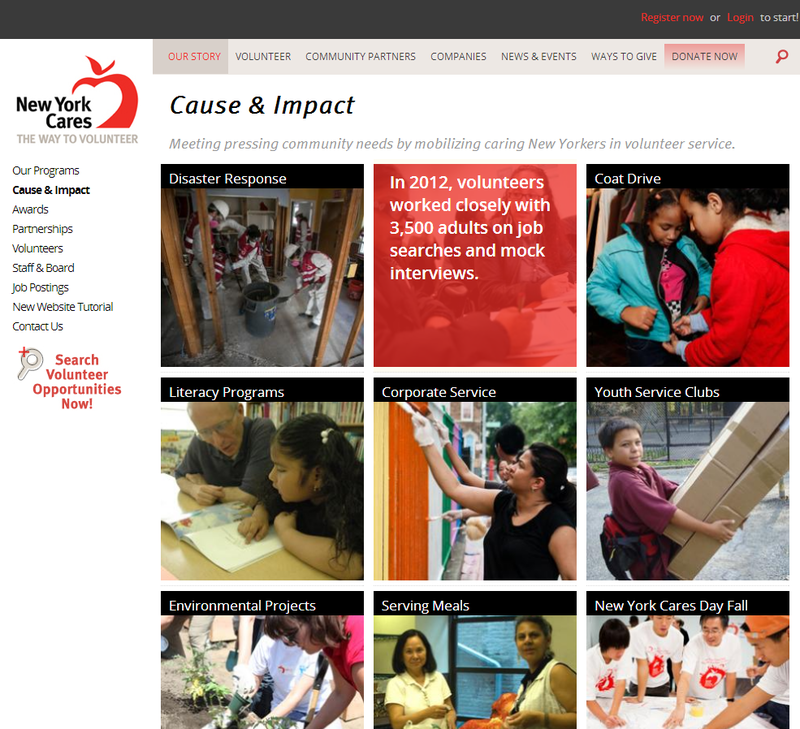 Through the redesigned Website, New York Cares can better demonstrate why it is the leading volunteer organization in New York City. Current and future volunteers can quickly access the information they seek through intuitive navigation, quick-access content blocks and sophisticated search. The Drupal CMS integration with Salesforce provides New York Cares staff with the tools needed to keep content up-to-date, allowing the organization to more effectively communicate about New York City projects, events, news, and donation opportunities.